Please consider donating to sustain the “FUTURE” of Conservative Judaism. All proceeds support our 5 seminaries and ensure the continuity the Conservative Movement and through the education of our rabbis, cantors, scholars and leaders. Sisterhood’s Torah Fund Classes. Click here for a list of classes. Click here to see Sisterhood Torah Fund Book Club Schedule. Contact Mary Ellen Bowers or call (847) 910-1080 to make your minimum suggested donation of $54.00. Make checks payable to Torah Fund. Checks can be left in the office in an envelope marked Sisterhood or mailed to Mary Ellen Bowers at 1092 Princeton Ave. Highland Park. Benefactor donations of $180 and above will receive the beautiful 5779 Torah Fund pin, designed by Eytan Brandes. In its 75 years, the Torah Fund Campaign of Women’s League for Conservative Judaism has raised close to $1 billion to support the education of the future rabbis, cantors, educators, and scholars who have served and will continue to serve as the gifted leaders and innovators of the Conservative/Masorti Movement. We are very proud of our strong commitment to Torah Fund, and we hope to contribute another $10,000 to this year’s campaign. We invite every member of Beth El to contribute. No contribution is too small and donations are tax deductible. If you attend a Torah Fund class or the Torah Fund Book Club, the suggested minimum donation to Torah Fund is $54. 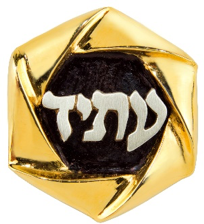 If you donate $180 or more, you will receive this year’s Torah Fund pin /pendant.